My love of horses began when I was a little girl. My first remembrance of a horse is the story of the Chincoteague Island ponies, Misty and Stormy. This brings back so many great memories. As time went on, my passion for horses grew stronger and stronger. Then there was Black Beauty and that helped make up part of the foundation as to why I am so passionate about horses, all horses. Riding since I was 10 years old, I was trained by an old horsemen who knew many of the old remedies and old ways of training & caring for horses. This man was kind of rough and I didn’t really agree with everything he did, but I was just a young kid. So I took in all of the good things I could get from this accomplished horseman who could get a horse to do anything he wanted. This man was just amazing. As rough as he was, he still had a soft side to him. He really did love horses but he was taught to be rough. My passion for horses grew into something bigger than I had ever dreamed. 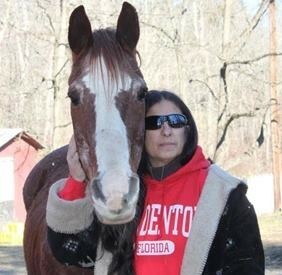 My first horse was a gift from my mom, a green broke stallion named Thunder. He was a great horse who taught me more than I ever imagined. He was so strong & loyal and we had a bond like no other. This sorrel colored horse, with a strong attitude, was a solid mount and was always looking to please in spite of being a stallion and stubborn--he was really a great horse. Fast forward to purchasing my first horse, Nasher. He was the best horse in the entire world! I found him when I was in my early 20s by going on a trail ride on the same property where I had learned to ride Thunder as a young girl. We were meant to be together. On this trail ride, I rode a horse that was really bad and my boyfriend at the time was not happy so we went back to the stable & asked for another horse. The owner agreed and told us the only other horse that was available was a green broke horse and he wasn’t bad just a bit green on the trails, so we agreed to take him on the ride. It was love at first sight and I knew he was going to be my horse. When we returned from our ride I asked if he was for sale and sure enough-- he was!! We agreed on a price and I went the next day to pick him up. I had been away from horses for awhile and had no idea where I would take him. Not very smart on my part, but I knew he was the horse I had always dreamed about. Fortunately, I found a beautiful farm with trails so I boarded Nasher there for about 10 years until the farm closed. Nasher and I were never really happy anyplace else but I always thought about the old farm. Years later, I happened to find the farm owners phone number so I called him and I ended up leasing the farm from him and 4 Winds Horse Ranch evolved from there. I gave riding lessons, took people on trail rides and boarded horses. I rescued a few horses to save their life and have them become a part of our team and that's when I became aware of the astounding number of horses that needed rescued from abuse, abandonment and/or slaughter and that's when Rivers Edge Horse Rescue and Sanctuary was born.